A person asks Bhagawan: "there is so much unhappiness in this world. What is the reason for this? Bhagawan replies: The unhappiness is due to the body and the mind. We identify ourselves with this name and body. But for person without this discrimination, there is no unhappiness. Each one of us has some element of unhappiness or the other. The irony is that we believe that some else is responsible for our unhappiness. That particular person or element is not allowing us to be happy. The point here is we have to realize that the happiness that we all long for is well within ourselves. It is not outside. Start looking or focus internally, instead of searching for happiness outside. Happiness is not outside in the world. You believe it is out there because you identify yourself with the body. You identify this body and name as the soul, which is not true. Happiness and peace are not present in any worldly objects. It is all within you. The rest is all a delusion (manokalpitam). Sri Nannagaru came to Hyderabad for a short trip on Sept 21 till 29th. It was mainly for the occasion of his birthday which fell on Sept 23rd. I was not able to go to the station and hence I landed up in SR Nagar flat at 8 in the morning for his darshan. No sooner did I get out of the lift to enter the hall which faces his room than I saw him. He was sitting inside his room, in Silence looking at the hall into which I was entering. He had finished his morning discourse in the hall and was sitting now inside his room facing the hall, the devotees in it and the door through which I entered. No sooner did I see him than I felt a jump in my heart and he raised his hand in a mudra of blessing. He looked like a deity in a sanctum sanctorum giving darshan. No sooner did I see him and mentally gave my pranams to him for his darshan, than he got up and closed the door. I waited till he finished his morning bath. Once he opened his door, I was ushered into his presence. Sri Nannagaru gave me his book 'Hithopadesam' and smiled at me. I sat down at his feet. My exuberance of emotion had made me post a lot of messages where I equated Sri Nannagaru to God etc. He smiled and spoke to me about other general things. The next day was his birthday and it was celebrated in a big function hall in Hyderabad. I usually would climb the stage and reach him fast for darshan. But that day I stood in line. Waiting for my turn. My inner feeling was that every devotee of Sri Nannagaru is a great seed with a banyan tree in it and a great love for him. Greater bhakthi than I had. So I had no right to break line and go for his darshan on the stage. So I stood in line. Later in the afternnon he gave his discourse where he talked about God being the Antaryami. I decided to follow this teaching of Sri Nannagaru. Everyone meditates on Lord Rama's feet. But Goddess Sita meditated on His Face. His face remained calm when it was announced that he would be made king one day and was asked to go to exile in forest the next day. This is the requirement and manifestation of Peace and Jnana. Hence Sita meditated on His Face.' He said. I began to imagine Sri Nannagaru in my heart as Antaryami. Being thus like that he was with me forever. There was no third party, no hurt. I started meditating on him like that. My visits to him began to drop in frequency and intensity as I felt that he was always with me and devotees who loved him more are enjoying his presence in SR Nagar. I was surprised at his words and a subtle eye in me opened and I realised that Sri Nannagaru saw everything as Alive, everything as Consciousness! I saluted him for that as the train slowly left the station. Despite the age of the body, tendencies of a person do not decrease or leave the body. They are difficult to be eliminated. Therefore, practice of meditation and chanting the name of the lord help in control of the mind. A gradual control over the mind will result in decrease of the tendencies associated with the body. Tendencies or thoughts are difficult to gain control. Even when a person who is a few hours or minutes away from death, fails to get rid of his/her tendencies. Therefore, knowledge is required to differentiate between the truth and untruth,that which is real and unreal. With the help of our mind we have to discriminate which work has been assigned to us. Performing good deeds for the society is a noble cause. People do earn money. But spending money for good deeds is very difficult than earning money itself. So, all cannot strive for the welfare of the society. God has created some souls to live for others or to do samaja seva (social work). It is in the society that they see God (Samaja bhagavan). They see the same god as in the shrine in the society. These people are great because they utilize their bodies to liberate themselves. Working for others is not a simple job. There are a few people who cannot think about helping others. They are termed as petty minded people. A person who has love towards the body cannot attain realization. Social work can lead to liberation, which is achieved through selfless service and not craving for recognition. Both mind and senses are reined, which leads toliberation or realization of the soul, the real truth or supreme bliss. Such a person is free from the cycle of birth and death, as there Is no difference between the soul and the body. Therefore, to attain this no difference state a person has to face and overcome fear and sadness. Fear is caused mainly due to duality that both soul (atma) and body (jeeva) are different. Having decided to spend some time with Sri Nannagaru I took the early morning flight from Hyderabad to Chennai. On landing I started to Arunachala in the taxi. As usual I kept looking for the Hill to come up in the horizon and as it did I felt the rush of joy in my heart. I called Gopika and confirmed Sri Nannagaru'S timings in the ashram. I checked into the resort nearby and went to Sri Nannagaru ashram in the hope of his darshan. He opened the doors of is room at 2.00 pm and on seeing me in the eager crowd asked me to come and sit down with him. He asked me when I came and where I was staying. Devotees behind me told Sri Nannagaru that I could stay in the ashram if I liked as a room was available. Sri Nannagaru asked me whether I liked staying in the resort or the ashram. "Mithin said 'Your wish Sri Nanngaru'. That is Sharanagathi' He smiled and looked at me. He then asked Gopika and Dr Karuna to accompany me to Sri Ramanaahram and show it to me and then bring me to Andhra Ashram. Guru's Child also had come and she promised to meet us in Andhra Ashram when we came back from Ramanashram. We all then went to Sri Ramanashram where I was stunned to see the photo of Bhagawan in the old meditation hall. It seemed so alive and full of joy on seeing me. I sat there and meditated for a while. After this we went to Andhra Ashram where Sri Nannagaru sat for sometime amidst devotees in the background of cool atmosphere and peacock calls. From there Gopika, Dr Karuna , Guru's Child and myself went for a quick car girivallam and retuned for early supper in Siva Sannidhi Guest house where Sri Nannagaru gave a small talk which I was not able to hear as I was a little away. As he ate his supper I went up to the terrace and saw Arunachala for some time. We all then returned to Sri Nannagaru ashram where the Guru sat in the front yard open space with his feet stretched. Devotees began to lightly massage his feet. Suddenly there was a heavenly body moving at slow speed in space over the ashram. We all looked at it and asked Sri Nannagaru to see it. 'It is the International Space Station, Sri Nannagaru' I said. He looked at like a child and expressed his happiness at the way technology had improved. He made in depth enquiries about it and I showed him the photo of it on mobile google. Gopika looked at me excitedly wondering whether I caught the phrase. I looked at Sri Nannagaru's feet and decided to massage them. But no sooner did I touch them than the Guru jerked his legs away from me. His eyes were closed. Then suddenly I saw the devotees slow Pradakshina of him as he sat. I decided to do the same and started to slip out. 'Mithin!' His voice boomed stunning me. He got up and before I could even start my circumbulation of him he went back to his room. I went back to my resort and joined Sri Nannagaru devotees the next day early morning for Giripradakshina at 1 o clock in the morning. Guru's Child was amongst them. After having completed about 10 km of the 14 km circuit, the mind in me protested and I felt what was the use of going around a Mountain when the living Guru was sleeping in the ashram? I decided to discontinue my Girivallam and told this to Guru's Child. Once there I circumbulated the samadhi of Bhagawan and went and sat in the Old meditation hall with the living picture of Bhagawan. As I gazed at the Supreme Beauty of the Bhagawan full of compassion I felt very happy. Next I returned to my resort and then checked out and came to Sri Nannagaru ashram. Sri Nannagaru was sittting with the devotees. Someone had asked him what to do when there were differences of opinion in workplace and when these differences eventually lead to unrest and enmity. How to avoid enmity and be happy with all? Then we had our breakfast and dispersed for sometime. Sri Nannagaru again met us in his room after sometime from where he went to the neighbor's house on invitation and sat there for sometime and gave spiritual tidbits. Sri Nannagaru smiled and came out. Sri Nannagaru next went and sat in his room in the ashram where we followed him. We chatted about some mundane matters bordering on spirituality. He asked me about what the health problem of Sonia Gandhi could be? I answered to the best of my knowledge. He also began to speak to some other devotees sitting around him. I took this as an oppurtunity and started to videograph him in my phone. I concentrated especially on his hands and feet and the movement of his palms. These are direct movements of Divine Conciousness I felt. Later he asked us to go and sit in the meditation hall of Sri Nannagaru ashram. There we all sat waiting for him. It was when I was waiting near his chair that hearing some devoteees sing in hope of meeting Sri Nannagaru I decided to sing him a song. I asked Gopika's help in asking him whether I could sing. All my life I wanted to sing to Sri Ramakrishna this very song. I felt very happy that this desire of mine was pleased. I sang...I dont know whether in tune or out of it...I sang. He looked at me with a smile and a mudra of blessing. 'Guru Devo Daya Karo Deena Jane' I cried. And the next moment Sri Nannagaru sang!!!!!!!!!!!!!!!!!!!!!!!!!!!!!!!!!!!!!!!!!!! He sang ' O God Beautiful' of Guru Nanak first. Saying this he sang a song of Ghantasala!!!!!!!!!!! The entire hall burst out laughing and enjoyed the bliss to its hilt! He smiled. We dispersed that day excitedly discussing how Sri Nannagaru sang. In the evening I was expecting my friend from Chidambaram who had called me up. 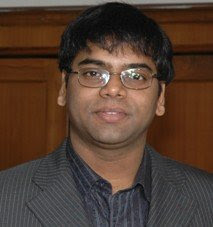 I told him that we have accomadation and he could come and visit me in Tiruvannamalai. It was his first trip and it was full moon night. I waited for him in Ramanashram and when he arrived he was stunned to see the number of people walking around Arunachala. I told him that this is Giripradakshina and is very sacred especially so on full moon nights and hence lakhs of people visit this place. I rememebered how I was not able to complete the girivallam that day morning and wondered whether I should go and complete it. My friend agreed and taking Deepu with us who was th son of Nagalakshmi aunty a very close associate of Sri Nannagaru we went for the Mountain pradakshina. We trudged along my feet aching and complaining but by supreme force of willpower I completed the Girivallam by 4.30 in the morning. It was five by the time we slept and missed meeting Sri Nannagaru in the morning darshan at 6 o clock. We went to the 10 o clock darshan whence I introduced my friend to Sri Nannagaru. The Guru looked at him and smiled. We later went to Rmanashram and then my friend took leave. I went to the afternoon darshan of Sri Nannagaru where his talk bordered on Ajata Vada. I asked him whether Ajata Vadam can be discussed with a point view of Intellectual Conviction. Then we changed the venue from his room to the old meditation hall where Sri Nannagaru asked me how I was planning to go back. I told him about my night travel by taxi to Chennai airport and how I had booked an early morning flight. 'Oh' he said and was silent. Later in the evening I came to know that Sri Nannagaru's devotees from France had sustained an injury and I rushed to the hospital and gave her some comfort and noting the seriousness of the injury asked her to be shifted to Vellore. I apprised a concerned Sri Nannagaru over the phone that she was out of danger but needed expert observation for a few days. He agreed and asked her to be shifted to Vellore. I came back and sat with Sri Nannagaru. I told him what my friend had said when we were going around the Mountain. The devotees around smiled in joy. Sri Nannagaru smiled and was Silent. 'What is that?' he asked craning his neck. He smiled and had looked at me. Now in the eve of my departure he was Silent and calm. I nodded and saluted him. 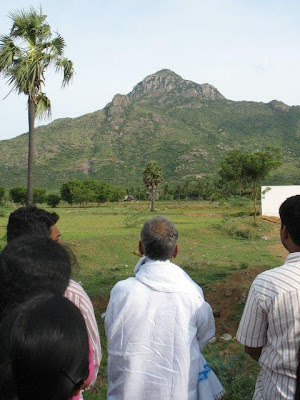 After we dispersed I went along with Guru's Child and Ravishankar garu to Arunachala temple. After a beautiful darshan there I came out of the temple waiting for the others to come out whence I saw hundreds of devotees exiting the temple. As I looked at them I clearly perceived that they were just bodies with intricate tendenciers and maya around them. It was a surreal few mnutes whence the eyes questioned the illusion of reality and I felt the Source for some moments while watching the illusion of forms.